Roger Federer became the first man to win Wimbledon eight times and extended his record to 19 Grand Slam titles with victory over Croatia’s Marin Cilic yesterday. Federer, 35, finished the contest in one hour and 41 minutes to claim his first Wimbledon title since 2012. He becomes the oldest man in the Open Era to win at the All England Club. With 19 major titles he extends his lead over Rafael Nadal in the men’s game to four. Among his long list of achievements, Federer became the first man since Bjorn Borg in 1976 to win the Wimbledon title without dropping a set. 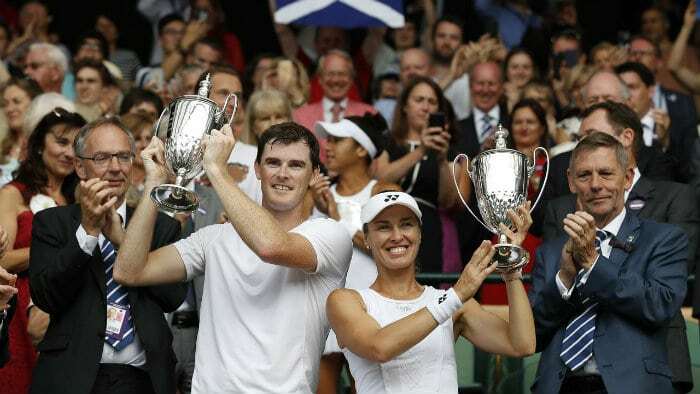 Meanwhile, top seeds Jamie Murray and Martina Hingis beat defending champions Heather Watson and Henri Kontinen 6-4 6-4 to win the mixed doubles. The British and Swiss pairing, both former title winners at Wimbledon, broke Watson and Kontinen in the seventh game of the match en route to taking the first set. They repeated the feat in the seventh game of the second set to lead 4-3. Murray and Hingis then held serve in the 10th game to secure the title.